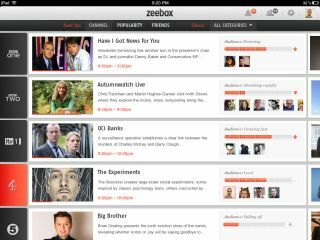 Today sees the launch of Zeebox, a free iPad and web app from Anthony Rose, the man behind iPlayer, designed to make your solitary TV-watching experience more of a social jamboree. At first glance, the app simply looks like an EPG – it shows you what's currently on TV (taking in all the Freeview channels and some premium Sky and Virgin Media ones too) and what's coming up next. Smart TVs can make use of the iPad app as a remote control. But connecting Zeebox to your Facebook account is where the fun begins; it lets you pick what you're watching, see what your Zeebox-using Facebook friends are watching, invite them to watch something "with" you, instant message them or hide from them if you happen to find yourself watching Strictly Come Dancing. Twitter gets in on the action too, with each programme's relevant tweets being displayed in a pane on the tablet or computer screen, allowing you to tweet directly from within the app. There's also a credits and synopsis panel, plus a news ticker of stories related to whatever it is you're watching. They've also managed to cram in a 'relevant apps' section – so if you're watching BBC News, it'll show you the BBC News App and you can hop straight over to the App Store and download it. That's all well and good, but what's really clever is Zeebox's clever tagging system. Using what Anthony Rose, creator of iPlayer and co-founder of Zeebox calls 'special sauce', a rolling ticker tags words, names, subjects and even products as they come up in the course of a programme, allowing you to tap the topic you're interested in and instantly find out more. Great for TV-watchers, but even better for advertisers and product placement, giving viewers a direct route to buy any gadget or gizmo they've seen on the goggle box. At the moment, the tagging system is totally automatic so it's in no way controlled by the programme makers or editorialised – although that's something that will come. The app's APIs will be made open so that devs and producers can tinker with the code and add their own two cents to the service. "It's a new era for broadcast TV," Rose explained to TechRadar. "Like Facebook is the platform built around social, and FourSquare is the platform built around location, Zeebox is the platform built around TV," added co-founder Ernesto Schmitt. In these post social networking, smartphone-savvy days, just watching television isn't enough for most of us any more, we have to go online and tweet about what we're seeing, check actors' CVs on IMDB or Google a sub-plot and Zeebox lets you do pretty much all of that from one handy interface, so there's no tedious app switching to bother with. In fact, a 'social EPG' is something that Facebook has been eyeing too – and while the social networking giant is impressed by the app and features heavily in it if you choose to link the two together, Rose describes Facebook as something of a "frenemy". Zeebox launches today on the iPad and as a web app but will hit the iPhone with a dedicated app by Christmas, with Android and all other platforms coming next year.